Government backing means scientists in Kent are ensuring we can grow more, buy more and sell more British fruit whatever the weather. 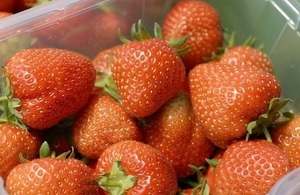 Government backing means scientists in Kent are ensuring we can grow more, buy more and sell more British fruit whatever the weather, announced Farming Minister George Eustice today. Thanks to £1.9 million in Government support, researchers at the National Fruit Collection in Faversham can identify the varieties of fruit most resilient to extreme weather conditions. From apples that can withstand drought to cherries and plums that can flourish in heavy rain, the vital research on the Defra-owned collection is helping to safeguard the future of British farming and ensure we can enjoy the best of British all year round – whatever the weather. With access to more than 3,500 different fruit varieties, the ground-breaking research is also revolutionising the types of fruit we eat – a ‘micro pear’ was discovered in the archives of the National Fruit Collection by a major supermarket. Our world-leading scientific research and strong fruit-growing heritage means scientists are finding new ways to ensure our food and farming industry continues to thrive. These developments mean UK consumers can enjoy our delicious berries, apples and pears come rain or shine and will also bring new opportunities for growers looking to export quality produce. This year has been a bumper year for fruit crops, with near-perfect conditions resulting in six times as many apricots and 20 per cent more home-grown cherries than in 2014. With worldwide exports of British apples worth £16.3 million in 2013 —double the value in 2010 — there is real potential to further grow the fruit market to create jobs and boost the UK economy. It’s hard not to be astounded by the range of varieties in the National Fruit Collection and I’m extremely proud to have a role in research to increase fruit resilience, ensuring that even as changing weather patterns affect crops, we can continue producing fruit for the nation. The bank of open data and the collection are recognised as international assets, and we invite researchers, breeders and growers to make the most of them.